Happy last Friday in August! I mean.. how did that happen?! We've had a rough week over here, I think Rowan is allergic to sleep (ha!) between the hours of 4:30 AM and 7 PM, so my favorites today are going to be short and sweet! Y'all I love our new rug for our guest room! The colors are even prettier in person. Its pretty thin so I wouldn't recommend it for a high traffic area, but its super soft! And no, we haven't had any boot weather here in Charleston yet (insert grumpy face emoji) but the cooler temps up North made me super over the summer. I can't wait to break these booties in with some skinny jeans and a cardigan! I'm not sure if there is a greater invention than funfetti cupcakes, but funfetti cookies are right behind them. I just used the box cake mix with 1/3 cup of vegetable oil and 2 eggs. So easy and perfect for my sweet tooth. Now if only I got this excited about the veggies I also purchased! Emily Ley: "3 Steps to Overcoming Overwhelm"
Wearing multiple hats (mom, employee, wife, blogger, etc) has taken its toll on me the last few weeks, and its easy to get overwhelmed. Making time to take care of myself and do what I love (i.e. blogging or working out!) has not been a priority, so Emily Ley's post really hit me. It might seem like obvious advice but it really helped to read it! Highly recommend! Rowan looks so much like me in the photo above, I can't get over it. I still see a lot of my husband at times too though, I think he's a really perfect mix. Y'all I can't help myself... 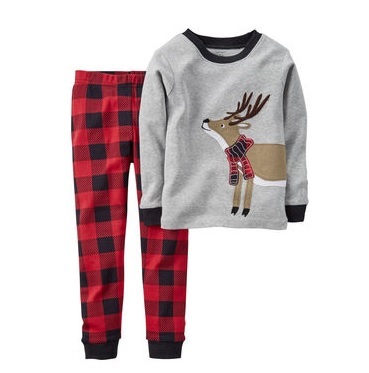 I'm already stocking up on festive pajamas for Rowan. I picked up these and these, now I just have to hope I guessed his size right! Holidays are going to be so much fun this year! Linking up with April and Christina! Your new rug is gorgeous! It might not be boots weather yet but this morning's crisp air has me feeling like it's coming soon :) Have a great weekend! Love those booties. I had my eye on them during the Nordstrom sale but they sold out so quickly!! Oh my gosh - guessing sizes is the worst! I'm afraid to buy Halloween outfits because he's growing so fast! That outfit is so cute though! I LOVE the rug you chose. The colors are gorgeous! And I'm definitely checking out that overwhelmed post. Hope you guys have a good weekend! Love your new rug! And those cookies... Yum! I love that rug. I really want to find a nice Persian rug for the next place we live. Have a great weekend! Your rug is fabulous! And I'm over Summer too... come on cooler temps! Love the rug! I totally went and spied those booties at my Nordstrom. They are so cute!! You should check out Hanna Andersson for holiday pajamas. The sizing is a little odd (European) but really cute stuff. Nordstrom carries some of it too. I need to find a spot in my house for that rug -- it's gorgeous! Loving the booties, too! Happy weekend! I love those booties and I need those cookies in my life like yesterday! That rug is seriously perfection! I'm obsessed with pjs! And now that I have two to buy for?! Oh man. The obsession grows! ROWN IS YOUR TWIN! 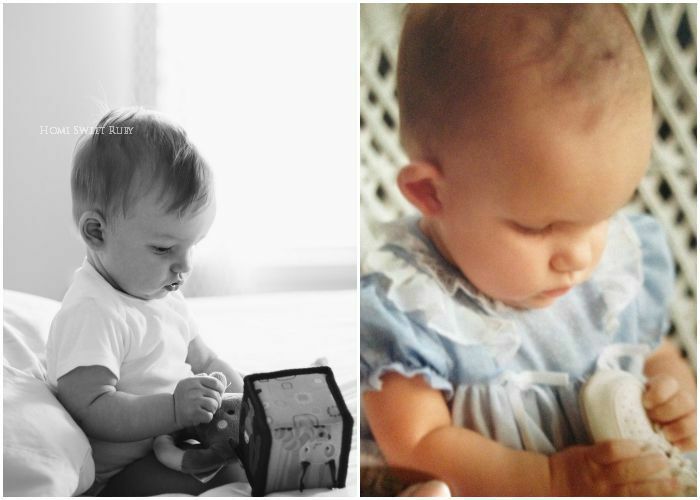 You two look so much alike in those pictures! And of course love that rug need those booties. Those pjs are precious!! I'm so addicted to kid clothes. You do have a mini-me!! And that rug is BEAUTIFUL!! Christmas jammies already?? They are adorable! Love your blog. those cookies look yummy! Omg the comparison photo and those PJs! Love! That rug is beautiful! And the funfetti cookies look delicious! Those funfetti cookies look fantastic. I'll have to tell my sister-in-law about that - she's obsessed with funfetti cupcakes! Great rug. And I'm also looking forward to Fall. I can't wait to get out all of my sweaters and scarves!